Sandy Kenyon has more on the Oscar race. NEW YORK (WABC) -- Friday marks the start of Oscar voting. More than 6,000 members of The Academy of Motion Picture Arts & Sciences have two weeks to choose the lucky few who will be nominated. As I discovered at The New York Film Critics Circle this past week, the Oscar race is run on smiles and schmoozing! Armie Hammer, who is currently generating buzz for his role as a young man flirting with a younger man in 'Call Me by Your Name,' told me he's "now spent nine times longer, literally nine times longer promoting the movie than we did actually shooting it." His film is in the hunt, but the one judged best of 2017 by the New York critics is 'Lady Bird,' and the indie film has a chance to win as man as four Golden Globes on Sunday in LA. 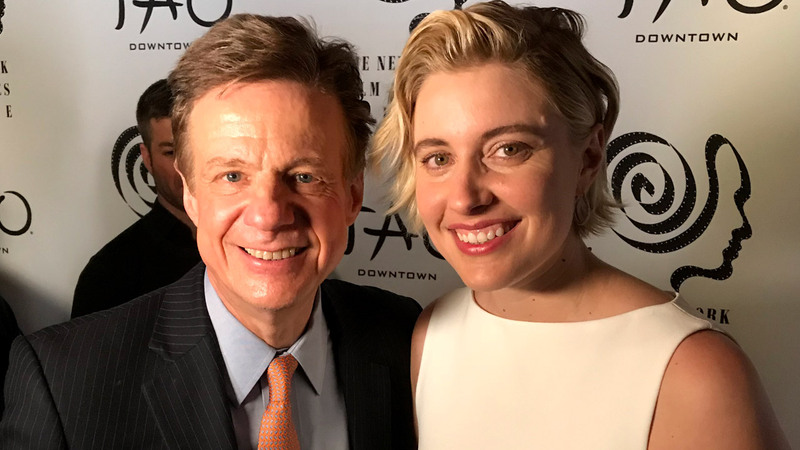 It's the first movie directed by the actress, Greta Gerwig, who told me this is, "an extraordinary moment and what I hope is that other women see it happening and say 'I'm going to make my movie now.'" Saoirse Ronan earned an award from the reviewers for playing the title role of Lady Bird so I asked her about Gerwig. How important is it for a director to be a performer themselves? Does it help? It's not essential, said Saoirse. "Plenty of good directors have never performed, but it does help. They just have an understanding of what it's like to be in the mind of an actor because it's a very peculiar; it's a very peculiar place," she said. It can be a vulnerable place -- often filled with insecurity, but I didn't get that from Tiffany Haddish! In response to that perennial red carpet question, 'What are you wearing?' she replied, "this is a success dress, Baby! I only dress for success!!" Success came after she took a 'Girls Trip' to New Orleans for director Malcolm Lee and the result grossed more than $100 million. It's fair to say Tiffany was THE break-out comedy star of 2017. "When did you know that this was going to be the break through?" I wanted to know. "The second day of shooting," Tiffany replied. "Malcolm Lee was like 'just do what you think is right.' And, when he said 'do what you think is right' I was like 'Oh, this is gonna be fun! We're gonna have a good time!'" Haddish recently hosted 'Saturday Night Live' -- which was a lot like sweet justice for her because she'd been rejected twice when she auditioned to join the cast before fame came. Now, Tiffany can afford to be philosophical telling me, "Sometimes you don't get what you want, and that's because there is something bigger and better ahead for you!" Can this machine really give you instant abs?